My name is Pernille Holm, and my age is 49. My job is to encourage people I meet not to be afraid to show their personalities. It thrills me when people appreciate and find inspiration in what I do. I love my job and I'm grateful that I get to work with different people in different situations. Styling is about bringing out people's personalities - it's unserious, serious business! Whether I'm acting as a personal shopper or transforming an actor/actress into a new character on set, I get so much out of seeing the confidence they project. That's what it's all about - inspiring people and bringing out their personalities in a natural and confident way. I would stretch it and say that often, when done right, it's like magic! I was born with a lot of energy, some would even say I have too much of it, yet it has always been my ultimate drive. This inherent feeling of always being on the lookout for new challenges is what fuels my life with eagerness and excitement of exploring new things. Over the years, I've learned how to navigate this state of mind and luckily enough, it fits me perfectly as a freelancer. I've always been a hard worker, although I never forget to live in the present and be grateful for what I have. Every experience, every travel and every inspiring and likeminded person you get to surround yourself with is never to be taken for granted. However, you must keep in mind that hard work is never without sacrifices. I love spending time with my beautiful, fun family and I believe they love spending time with me, so I think I've done a great job here! I also spend time with friends, do yoga, go to the movies, drink and dance - I love to dance and I never say no to a good party! I do everything I can to get the most out of my time, although, if asking my husband, he might say that he wishes his next wife to be older, more tired and more homebound. I mainly get inspired when I travel. Exploring new cultures gives you a lot of new input on how to look at life, but you can really find inspiration everywhere; the streets, the city, movies, food, theater, music, vintage stores, antique flea markets and Instagram. It's all about being open-minded. I've noticed one thing through my work life - there's nothing new under the sun! However, it's all about bringing new life through different combinations of people, textiles, prints and colors. How do you take advantage of an opportunity in life and in your career? I'm the kind of person that never say no, as the Danish saying goes "having the yes-hat-on". I'm really good at planning and that gives me an advantage. I'm always one step ahead. On the other hand, I easily get distracted, which is somewhat of a challenge. As a freelancer in a fast-paced environment, it's difficult to be in control of your next move. I often feel that I have little time to stop and reflect. Sometimes I wonder what life would have been if I would have aimed and focused on one thing, like landing a job at Italian Vogue, instead of occupying myself with a million things at once. I know I'm good at creating, I see everything in pictures, but I also know that I can't control and push myself in a specific direction - I just have to follow life itself. 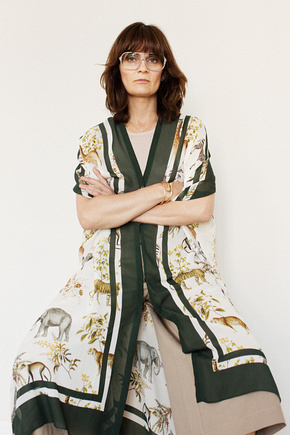 Pernille is wearing Caftan Agave Animal and Pant Karla in the image above.